Stranger Things’ Gaten Matarazzo Rocks Out With His Band Work in Progress! | Gaten Matarazzo, Sabrina Matarazzo, Work in Progress | Just Jared Jr.
Stranger Things' Gaten Matarazzo Rocks Out With His Band Work in Progress! Did you know Gaten Matarazzo could sing? 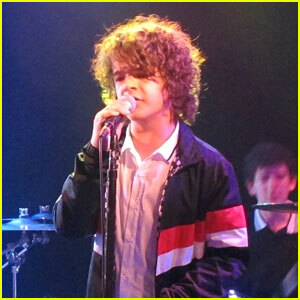 The Stranger Things actor and his band Work in Progress – which also includes his older sister Sabrina – brought down the house at the Troubadour on Friday (April 13) in West Hollywood, Calif. The band does mostly cover songs, but they showed off some original tunes as well. If you didn’t know, Gaten‘s Stranger Things co-star Finn Wolfhard also has a band called Calpurnia. Listen to their latest release “Louie” here. To watch a video of Gaten‘s performance, head on over to TMZ.